With 62 seats, the Delaware General Assembly is the second-smallest bicameral state legislature in the United States – ahead of Alaska (60 seats) and behind Nevada (63). 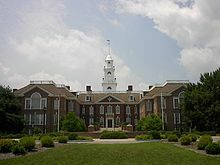 The Delaware General Assembly was one of the thirteen legislatures that participated in the American War of Independence. Created by the Delaware Constitution of 1776, its membership and responsibilities have been modified by the Delaware Constitution of 1792, the Delaware Constitution of 1831, the Delaware Constitution of 1897, and Supreme Court of the United States decision in Reynolds v. Sims in 1965. Significant actions of the General Assembly include the calling of the constitutional convention which became the first to ratify the United States Constitution in 1787 (which led to Delaware's state nickname, "the First State"), and its rejection of secession from the Union on January 3, 1861, even though Delaware was a slave state. Also significant was its repeated refusal to legislate the end of slavery or voting rights for women, requiring federal law to enforce those changes. Until 1898 the General Assembly was apportioned by county, with a total of 30 members elected county-wide " at-large" with equal numbers from each of the three counties. After 1898 the total membership was increased to 52 and they were elected from districts, mostly corresponding to the geographical boundaries of hundreds within the counties. However, there was little recognition of disparities in population, except for the addition of two extra senators and five extra representatives elected from much more populous New Castle County. After the Supreme Court decision in Reynolds v. Sims in 1965, the General Assembly was forced to redistrict so that all members of both houses were elected from districts of equal population. By 1972, the total membership had increased to its present 62. ^ Weatherford, Doris (2012). Women in American Politics: History and Milestones. SAGE. p. 96. ^ "ARTICLE. XVI AMENDMENTS AND CONVENTIONS". delcode.delaware.gov. Retrieved 6 April 2018.